Mens colored shirts with quality richness is assured out of all the mensusa on quality. But Mensusa doesn't have any issues on the quality because they source the finest material of linen for their shirts. Most of these are very much in latest trendy varieties. People like colored patterns for various occasions to feel unique and stand out unique in a crowd. This is possible with the mens colored shirts now. They have plenty of varieties including blue, orange, mint green, gold, black silver, etc. Finest raw materials and dyeing patterns are used on linen and raw silk to give the richness and long lasting life with fading colors. Maintenance becomes very easy with dry wash or machine wash. Cold iron is only allowed and you can sun-dry in shaded portions to get longevity to style and color. Mensusa offers very good price range for these where most of the shirts fall in very average or low priced category to make it possible to be owned by every income class. Those who need comfort while shopping and seeking good speedy transaction in shopping can visit the online stores of mensusa.com and buy right away. To those people who love green shades and want to go green on a relaxed day can opt for this mint green dress shirt. Its got lovely patterns in stripes or plain shaded shirts. It will go well with tuxedo suits or blazers and cowboy boots or a leather hat. 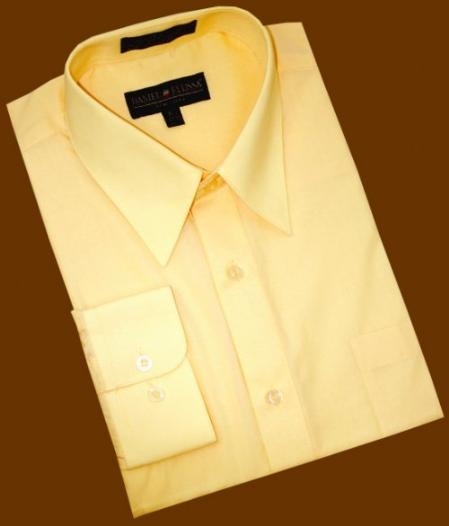 Classy and rich orange dress shirt is available for those fair and handsome men out there. They can get that lovely tint of sunshine on their dress with blazer suit combos or black tie combinations that will suit well. Tie and shirt combination is not new but gold dress shirts and black tie combination is one classy look for parties or special occasions. It is one part where people can get lovely and groovy on dance floors on cocktail parties. Gold is such a party color. With the usual color combinations doing the rounds, the mens silver dress shirts are all very well crafted in unique clothing category. This unusual color shade is pretty by itself. Hence keeping accessories very minimal is important. If you're looking for a bright shirt, then this navy blue dress shirt is the right choice for this. You got to be accessorizing yourself in very minimalistic pattern to highlight the bright navy blue color tone. Designer collections are all kept to be toned up for special occasions including this shirt. The special or grand occasion is more highlighted when you wear this mens black silk shirt. They come in pure silk with pearl embellished button work and upright collar front. This is very manly and charming.